But to the brave and properly geared, the river delivered as it usually does in early March. Our goal was to catch trout on the the three disciplines; nymph, streamer and dryfly. We failed on the dryfly, surprisingly. The midges were there, fish were occasionally rising, but we couldn't connect. I was pretty bent about it - we should be able to find at least one sipper to feed. Nymphing was good but streaky, and all the fish were exactly where you should find them - slow inside bends and deep. 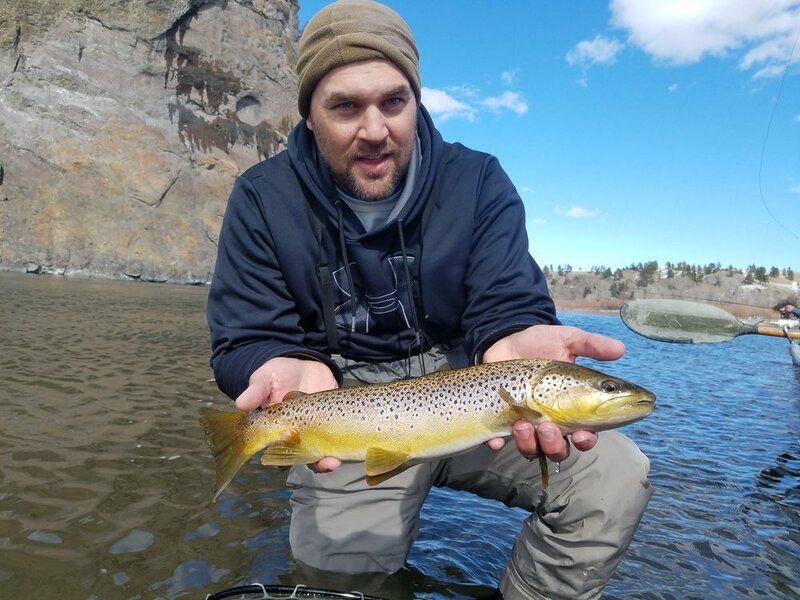 The streamer bite was excellent and the brown trout were willing to chase and grab more than they usually do when the water temperature is 35 degrees. Dan and Scott were the perfect guys to knock the cobwebs out of the driftboat with. Fellow Marines celebrating Dan's recent retirement from the military, and cashing in on a gift trip from Dan's wife Eileen, toasting caught and missed fish with delicious high-end west coast IPAs. We fished until near dark and patted ourselves on the back for braving the weather and finding some great fishing as a reward. With the daylight savings time change and a high pressure system moving into the northern rockies this week we are looking at the first real feel of spring and any sort of warm weather since early December. Montanans are craving it and anglers are desperate for it. If we can get that water temp above 40 it will trigger even better fishing and make our spring special anglers happy to have made the trip for some early season trout action. It felt great to be back on the water to begin another guide season, and we look forward to sharing some river time with you too.